Pterodactyl Simulator 3D : Feel the power of huge flying reptile, fly high to patrol Jurassic jungles and find a new prey! Hunt, fight against other dinos and explore Jurassic skies and jungles with Pterodactyl Simulator 3D! Are you tired of usual animal simulators? Enjoy the life of flying Jurassic dinosaur – Pteranodon! Feel like a real dino with this game – survive and thrive in this Jurassic environment as a Pteranodon! Meet other dinosaurs – Tyrannosaurus, Velociraptor, Triceratops and other. Make friends with them, struggle against or even hunt to make these dinos your next meal! Try Pterodactyl Simulator 3D and be ready for great survival experience right in the Jurassic environments! Attack powerful dinos instead of being attacked! Kill or be killed! Be ready for battle against Tyrannosaurus, Velociraptor, and Triceratops – Jurassic jungles and skies are so dangerous place to live! Raise up your Pterodactyl survival and battling skills to attack as many dinosaurs as possible and finally stay alive! The more you play – the more your flying Dino grows and the stronger it gets! Let start a big hunt with Pterodactyl Simulator 3D! Chase birds, small dinos like iguanodon or ankylosaurus, and even mammals like boars, deer or rabbits! Gain great flight experience exploring Jurassic environments! Find mate to make a family and raise up ugly nestlings! Build your own army of angered Pteranodons with Pterodactyl Simulator 3D! As in other animal simulators, there is 3 indicators – dinosaur’s heath, energy, and fullness. If one of it drops – now chance to survive! Mind indicators and recover it by hunting and eating other dinos! Struggle against other dinosaurs and stay alive with this animal survival simulator! Feel like a real flying dinosaur – crash and attack everything on your way! Explore this dangerous area and have fun playing Pterodactyl Simulator 3D! Entertaining dinosaur battles, great flight experience and even more! 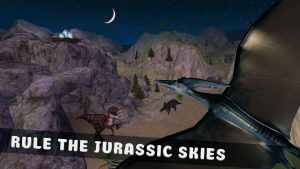 Try Pterodactyl Simulator 3D – ultimate dinosaur simulator in 3D. Explore Jurassic jungles, hunt, attack and fight for your life!